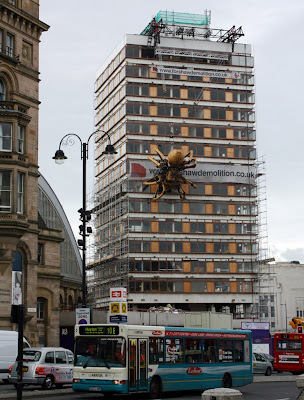 The biggest spider on Earth was spotted clinging to a Liverpool skyscraper this week. See it in action here. In related British arachnid news, a supermarket clerk recently discovered a deadly South American spider hiding in a shipment of bananas. Warning to banana lovers: Spider attacks are more common than you'd think! 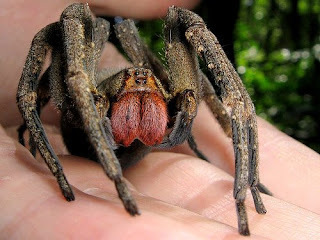 Below: A Brazilian Wandering Spider. Found July 2004 in Walsall, April 2005 in Bridgwater (where one bit a pub chef), and September 2008 in Kent. According to an expert, "the deadly arachnid has the largest venom glands of any spider and a very toxic poison." The Guinness Book of World Records has named it the deadliest spider in the world. Below: A Giant Crab Spider. In June, 2005, a man was bitten by such a spider when he picked up an innocent-looking bunch of bananas. Though it's not venomous, the spider's bite can be quite painful! 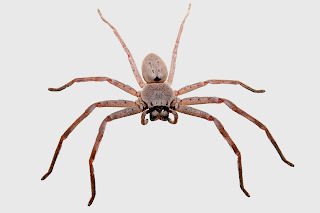 Below: A Huntsman Spider. Found April, 2004 in Newcastle-Under-Lyme. Not poisonous but really, really scary-looking. Not terrifying enough for you? Then check out this list of Seven Things You Don't Want to Find While Shopping! My first thought when I saw the biggie was, "Yeah, right, I bet it's Photo Shopped," but it turns out it's mechanical!! cool, only i kinda get freaked out by spiders. You WOULD have to post this now, when I'm already lying awake at night, worrying that there's a funnel-web spider in my bed. You have a talent for this sort of thing. my granma lives in liverpool, she told me about the spider thing ages ago.